Vulnerable populations feel the most harm from extreme weather events. As hurricanes are flooding and battering coastal regions in the Gulf Coast and Atlantic, millions are scrambling to survive—and soon to recover and rebuild. For years, Oxfam has been studying how the “hazards of place” pose heightened dangers to the most vulnerable. When a population is both socially vulnerable and especially exposed to climate hazards, the result is a wake of rubble and broken dreams. As climate change exacerbates the impact of environmental events, millions of people are stranded in harm’s way, and the most vulnerable are feeling disproportionate risk and damage. Yes, climate hazards are natural events in weather cycles. We’ve always had hurricanes and droughts, flooding and high winds. However, we’re currently witnessing a scale of destruction and devastation that is new and terrifying. The blows are more ferocious; and the vulnerable people in harm’s way are feeling the impact most acutely. The last couple weeks alone have seen a series of devastating climate disasters in various parts of the world. The hurricanes close to home – Harvey, Irma, and possibly Jose – are part of a growing, global trend of more intense and destructive storm cycles. From Houston to Haiti to Mumbai, millions of homes are underwater or blown over, and millions of people are homeless and impoverished. At Oxfam, we saw the vulnerable suffering the most in the face of Katrina: older people unable to leave their homes, suffering from health problems as medications lost refrigeration; ill and injured trapped in hospitals; working families waiting on their checks at the end of the month, lacking the cash to fill the tank and hit the road; immigrants who couldn’t find information about the incoming storm or shelters. And the recovery was even more inequitable, as tenants had no way to recover losses; homeowners without insurance lost their houses; workers scrambled to find employment, while labor protections were relaxed and conditions worsened. As we face a future with enhanced risks, it’s critical to face the reality of who bears the burden of our changing climate, and to prepare and respond appropriately. Why are the storms so fierce? Simply put, changes in the global climate exacerbate climate hazards. Increases in the temperature of air and water (even incremental), lead to rising sea levels, more extreme storm surges and flooding, heavier precipitation, and higher wind speeds. Warmer air can hold more moisture, and warmer seas cause water to evaporate faster, which means more rainfall during storms. At the same time, changes in patterns of human settlements – for example, paving over wetlands around Houston – reduces natural resources to absorb impacts of storms. The evidence is overwhelming, and the events are diverse: water, wind, drought, temperature extremes. Currently, we see an average of 400 “extreme weather events” every year. And so the toll of these changes begins to rise, in some cases dramatically. Since June of 2017, roughly 41 millionpeople have been affected by flooding. More than 150 million people live on land that will be below sea level or regular flood levels by the end of the century. Growing storm surges and tsunamis threaten nearly a quarter of the world’s population. In India, 1,600 people in India died due to extreme heatwave conditions. A horrific mudslide killed as many as 1,000 people in Freetown, Sierra Leone in July (triggered by torrential rain). What does it mean to be socially vulnerable to climate hazards? The challenges of social vulnerability can quickly turn life threatening in the immediate face of a climate disaster. People may lack enough money to find transportation (private or public), or they may have mobility problems, or their housing may be fragile, or the loss of power may leave them without vital refrigeration or methods of communication. Many are one big storm away from homelessness, unemployment, hunger, injury, and/or loss of life. When a climate disaster strikes, it hammers a community: water floods in; high winds topple power lines, trees, and structures; drought dries-up crops. While social variables such as income and age do not determine who will be hit by a natural disaster, they do determine a population’s ability to prepare, respond, and recover when disaster strikes. 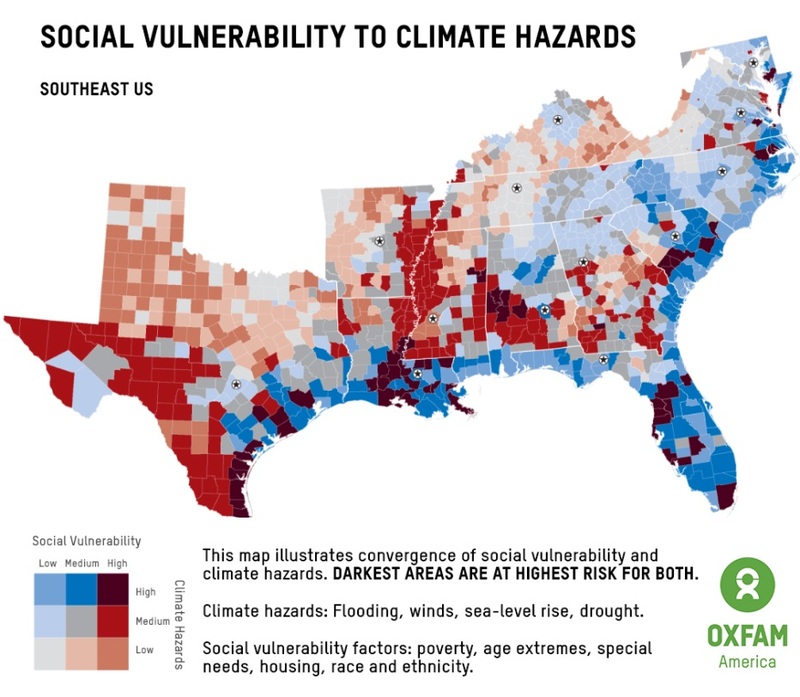 Oxfam worked with the Hazards and Vulnerability Research Institute (HVRI) to develop a series of Social Vulnerability maps for the southeastern states in the US. These maps measure and illustrate the convergence of social vulnerability factors (such as economic standing and age, among others) and four environmental hazards: flooding, hurricane force winds, sea-level rise, and drought. Below is a brief outline of the maps and findings. The Social Vulnerability Index from HVRI is a quantitative measure of vulnerability. Factors include the following. Economic standing is the number one factor in determining a community’s vulnerability to disaster. Poverty may prevent families from acquiring goods and services necessary to prepare for a disaster (generators and gasoline, canned food, alternative lighting, sufficient medication); and they may lack transportation to evacuate. Recovery is an even bigger challenge, as they are likely under- or uninsured. Age extremes (elderly or young) mean people are less mobile, more dependent on care, and less able to get out of harm’s way. Rural and urban communities each face special challenges when disaster strikes, and these communities have a harder time recovering. Both sparse and dense levels of population pose challenges. 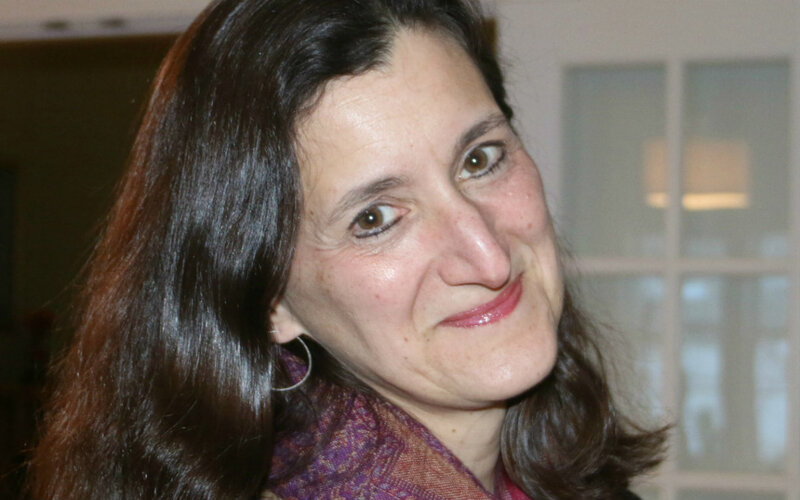 Special needs populations are less able to cope with physical and social challenges. Certain occupations are associated with social vulnerability. People engaged in low-paying jobs with few or no benefits are likely to find recovery difficult (as will the unemployed). Quality of housing can determine how well a household is protected from harm. 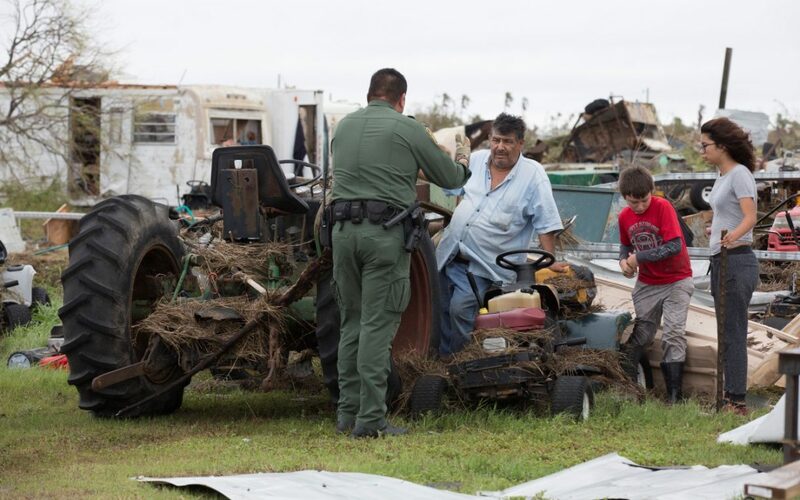 Housing and building types particularly vulnerable to disasters vary from mobile homes in rural tornado-prone environments to substandard or multifamily housing in densely populated urban areas. Racial and ethnic disparities can contribute to social vulnerability through lack of access to resources, cultural differences, and the social, economic, and political marginalization that is often associated with racial disparities. HVRI mapped four essential climate hazards. Flooding: More intense rainfall can lead to severe floods that cause significant deadly impacts regionally. Hurricane force winds: The destructive potential of Atlantic hurricanes has increased since 1970, correlated with an increase in sea surface temperature. Sea-level rise: An increase in average sea level of up to two feet or more and the likelihood of increased hurricane intensity and associated storm surge are likely to be among the most costly consequences of climate change (especially for the Gulf Coast). Drought: Decreased water availability owing to increased temperature, longer periods of time between rainfall events, and increase in water demand are all very likely to affect many sectors of the US economy. As the water recedes and the winds die down, the path of destruction is revealed – and the recovery work begins. For many, it’s a long, slow road back to secure homes, regular work, and safety. As the emergency funds and efforts flow into these areas, it’s incumbent on us to make sure the programs reach those who need it most. Coping with Disasterfocuses on Louisiana and Mississippi, and explores the impacts of the four climate hazards on the most vulnerable populations. Exposed explores all 13 states in the US Southeast, and illustrates how climate hazards affect vulnerable populations. I was recently in Houston giving a training on health and safety in storm recovery work. I saw first-hand the destruction and heartbreaking family disasters of Hurricane Harvey. Homeland Security Advisor Tom Bossert thinks we can address climate change, just “not the causes.” He’s wrong. Fire and drought, wind and rain. We’re all feeling the heat of climate change.